Leanne Marguerite Sapp, aged 37 years of Moose Jaw, SK passed away on Thursday, February 28th, 2019. She was predeceased by her grandparents: Paul and Peg Schaitel, and Ray and Myrtle Sapp; and uncle, Mike Schaitel. Leanne is survived by her parents, Dwayne and Paulette Sapp; brother, Matthew (Megan) Sapp and their daughter Averi; sister, Kirsten (Roldane) Senior and their daughter Kia; aunts and uncles: Marv (Diane) Schaitel, Karen Schaitel, Perry (Paulette) Schaitel, and Daryl (Shelley) Sapp; as well as numerous cousins. 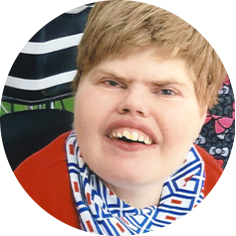 During her early childhood, Leanne attended the Developmental Centre in Moose Jaw. She moved into Moose Jaw Families for Change where she has lived for the last 15 years. Leanne enjoyed Barney, attending concerts and listening to music, being outside – especially sledding at the farm, and all of the activities that were provided by Moose Jaw Families for Change. A special thank you to the Moose Jaw Families for Change staff, Dr. Vermaak and Dr. Cheddie, as well as all of the care providers at the Dr. F.H. Wigmore Regional Hospital. A Celebration of Leanne’s Life will be held on Thursday, March 7th, 2019 at 1:30 p.m. in Moose Jaw Funeral Home. Dave Foley will officiate and a private family interment will take place at Sunset Cemetery. In lieu of flowers, donations in Leanne’s name may be made to Moose Jaw Families for Change, 335 4 Ave SW, Moose Jaw, SK S6H 5V2. Arrangements are entrusted to Moose Jaw Funeral Home, 268 Mulberry Lane. James Murdock, Funeral Director 306-693-4550. Dwayne, Paulette, Matthew, Kirsten and families. I am so very sorry to hear of Leanne’s passing. I learned so much from the time I spent with Leanne and often think back on those days! You are all in my thoughts and prayers at this time. Dwayne, Paulette, Matthew, Kirsten and families – The Lindale School family is sorry to hear about Leanne’s passing. We are thinking of you all during these difficult days. Take care. Dwayne and Paulette we send our sincere sympathy and sending hugs! Sad to hear that Miss SAPP had to die so young. Our sympathy goes to all in the family. May they all be comforted by the ressurection hope mention in Acts 24: 15. Our thoughts are with all of you. Barney had a great friend !! Our sincere sympathy to the Sapp family on Leanne’s passing. Sending kind thoughts and prayers during this very difficult time. To the Sapp family so sorry to hear about Leanne, thinking of you at this sad time. I wish to offer my sincere condolences to the family of Leanne. She was such a sweet little soul. As her art teacher at the Moose Jaw Museum & Art Gallery, I always appreciated her enthusiasm when creating. My Spring session classes begin on Thursday evening. I am sad at the notion of not seeing Leanne’s name on a class roster anymore. Rest in peace little one; you are safely held in the hands of God. Sincere condolences, Paulette and Dwayne, and family. My condolences to all of Leannes family. Leanne and my son Andru shared time in the school setting at St. Michael School, and at Diversified. Leanne always had a great demeanour and a smile when you greeted her. She was a sweet young lady. My heart goes out to all your family. Hugs to you all. Dwayne, Paulette & Family. We were very sorry to hear of Leanne’s passing. Our thoughts and prayers are with you and your family. Our deepest condolences. Dwayne, Paulette and family,. Sorry for your loss! So difficult to say goodbye to Leanne. Thinking of you at this difficult time!